NASA's Aqua satellite flew over Typhoon Ketsana during its lifetime and captured infrared imagery on a daily basis. The images showed high, cold, thunderstorm cloud tops (purple) as cold as -63F, as they dumped heavy rains over the northern Philippines and Vietnam. Although Ketsana was a tropical depression when it made landfall in the northern Philippines, it brought record rainfall, creating deadly flooding and mudslides. Flooding killed 246 people in the Philippines, and affected more than 2 million homes there. Ketsana made landfall in the Vietnamese province of Quang Nam at around 2 p.m. local time. When it made landfall, it was a Category 2 typhoon with maximum sustained winds of up to 144 kilometers per hour (90 mph). In Vietnam's central highland province of Kon Tum, Ketsana destroyed or damaged approximately 170,000 homes, and crops and irrigation systems. More than 350,000 people were evacuated before the typhoon made landfall. Ketsana was downgraded to a tropical depression after crossing into Laos early Wednesday. Even in Cambodia, Ketsana killed 9 people and destroyed almost 100 homes in Kampong Thom province, which is located 80 miles north of the capital Phnom Penh. NASA's Aqua satellite flew over Typhoon Ketsana during its lifetime and its Atmospheric Infrared Sounder (AIRS) instrument captured infrared imagery from September 26-30. The images showed high, cold, thunderstorm cloud tops as cold as -63F as they dumped heavy rains over the northern Philippines and Vietnam. That data helped forecasters see that Ketsana had powerful rain-making thunderstorms. AIRS provided valuable infrared data on Ketsana's cloud top temperatures, which are important because they tell forecasters how high thunderstorms are, and the higher the thunderstorm, the more powerful. 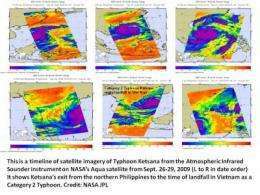 Satellites provide helpful information to forecasters on what to expect from the storm, and forecasters in the Philippines posted warnings the day before Ketsana (called Ondoy in the Philippines) made landfall. Now, forecasters are watching Typhoon Parma approach.